Honeycrisp is the world’s most popular apple! Honeycrisp! Need we say more? Honeycrisp is a rather new apple, only about 20 years old in the apple marketplace, but it has gained a considerable reputation and has set the new “gold standard” for apples. Honeycrisp is “explosively crisp” when properly raised, stored, and marketed. It has a good flavor, but it isn’t as intensely flavored and tasty as many other apples. What it is though, is an apple that Grandpa says sells itself by assaulting your ears! When you bite into one, you actually hear how crisp it is inside your head. Honeycrisp has a lot of good qualities which make it so popular. BUT, with the GOOD comes the BAD! 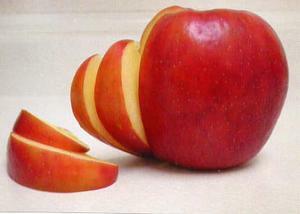 For commercial growers, Honeycrisp is one of the hardest apples to grow well and get good quality. Without the right site, conditions, and grower care it can be a disaster! Grandpa’s Orchard sells a lot of Honeycrisp trees. It is likely our most popular variety. But, please be warned that it is one of the hardest apple trees to grow successfully in the backyard. If you have Honeycrisp now and are harvesting great apples, don’t change your methods! You seem to have found the trick! Honeycrisp trees often exhibit a funky appearance to their leaves. At first this was speculated to be due to leafhopper damage. I can’t find a picture at this time to show it, but it appears to be a yellow mottling on the leaves. The leaves often seem to be more brittle and fleshy. This is actually caused not by bugs or leafhoppers, but by the genetic disposition of Honeycrisp to store starches in the leaves. During the daytime, the leaves photosynthesize and make sugars and starches, which normally are transported down to the roots. For some reason, Honeycrisp has difficulty in transport and so these starches get caught up in the leaves and cause the discoloration. In the nursery, I see this characteristic in many of the Minnesota bred apple varieties to varying degrees, so it appears to be genetically linked to the parents of the cultivar. Honeycrisp fruit is also very prone to a fruit disorder called bitterpit. Bitterpit is quite common on many apple varieties and starts out as discolored, darker, sunken spots on the fruit. It often is associated with younger trees and short crops, where larger than normal fruit is produced. Bitterpit is a disorder related to how the element and nutrient calcium is transported throughout the tree. To help alleviate the prospect of bitterpit, growers make sure that calcium is readily available in the soil, and often times, especially with Honeycrisp, will apply calcium sprays many times during the season to help provide sufficient calcium. Even then, sometimes, other factors still result in bitterpit being a problem. Usually as the trees mature, grow older, and set more consistent crops, bitterpit becomes less of a problem and can often disappear entirely. Honeycrisp fruit is very crisp. This is due to the unusual large size of the cells in the fruit. This also causes some problems with Honeycrisp being more prone to bruising (handle them carefully!) and storage problems (any puncture of the skin can often result in the fruit rotting in storage). Sometimes, due to the calcium problems and other unique genetics of Honeycrisp, growers have found them to be troublesome to store for long periods. Sometimes, perfect apples will go into cold storage and come out months later as good as they went in, and sometimes they will go in looking great and be junk when they come out a few weeks later. Researchers are slowly finding solutions to these problems. Honeycrisp is also not a highly vigorous tree, so planting on very dwarfing roots in light sandy soil may result in “runting out”. We often recommend planting Honeycrisp on a slightly more vigorous rootstock than most other varieties. So what Grandpa is trying to say, is be forewarned that while eating a Honeycrisp may result in a “perfect apple eating experience”, growing your own Honeycrisp apples may be a less than perfect backyard orcharding experience. Good luck! Try growing Honeycrisp apples in your own backyard. View more of Grandpa’s favorite fruit varieties. ← Planting fruit trees in the fall.